Being a lover of Broadleaf, I couldn’t pass up the the La Casita Criolla Lancero any longer. Produced in Esteli, Nicaragua at My Father S.A., the La Casita Criolla Lancero is made with 100% U.S.A. Connecticut Broadleaf and produced in three regular production vitolas: HCB (5 1/8 by 42 Corona), HCBC (5 5/8 by 46 Corona Gorda), and HCBF (6 1/2 by 48 Short Churchill). To my knowledge, the La Casita Criolla Lancero is only available with the sampler. 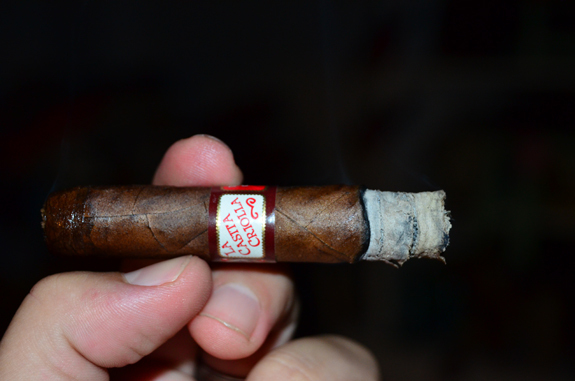 Tony reviewed the La Casita Criolla HCBC back in 2011. You can find the review HERE. The La Casita Criolla Lancero wears a very dark brown Connecticut Broadleaf wrapper that is rustic in appearance with its color imperfections, dark water spots, bumps, and veins. The dark color of the medium size veins gives them an even larger appearance. As light hits the wrapper, tiny crystals sparkle on the wrapper. There is no visible tooth, but the wrapper leaf does feel like a very fine grain sandpaper. 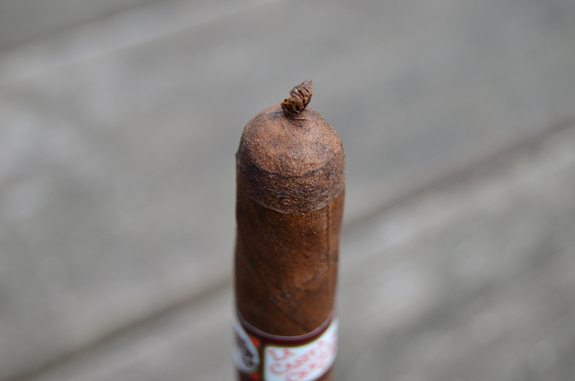 Other than the foot of the cigar being spongy, the rest of the cigar is evenly and firmly filled. The wrapper gives off aromas of earth and barnyard, while the foot has an extremely pungent barnyard smell with deep cedar notes. The small pig-tail cap clips easily revealing a stiff draw requiring an additional clip. After the second cut, big notes of chocolate, cedar, and cinnamon greet my palate. The initial profile is of earth, leather, and spice, with an underlying yeast flavor. The spice picksup rather quickly leaving a spice tingle at the back of throat and all around my mouth and then exits the profile. At a half-inch, a pencil-shaving flavor and unsweetened cocoa make an appearance. 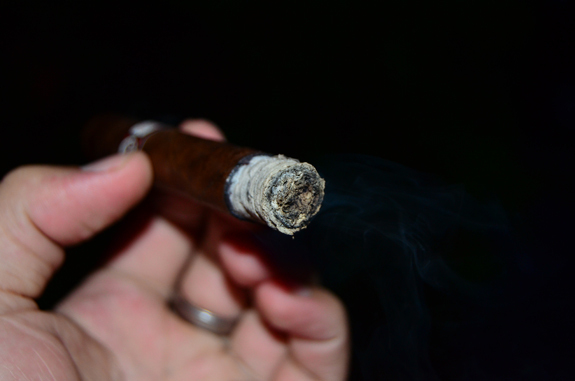 A beautiful white ash is formed as La Casita Criolla burns evenly. The cocoa remains, the pencil-shaving evolves to a deep woodsy flavor, and black coffee joins in along with a jelly-like sweetness. The deep, dark flavors are in the medium/full realm, while the strength is picking up steadily to the low-side of medium. 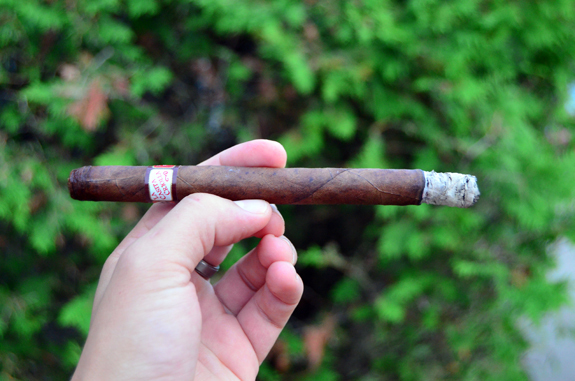 Other than the burn that has a small wave, the La Casita Criolla Lancero is chugging along effortlessly. The finish of the smoke remains heavy as coffee and earth notes linger on the palate. 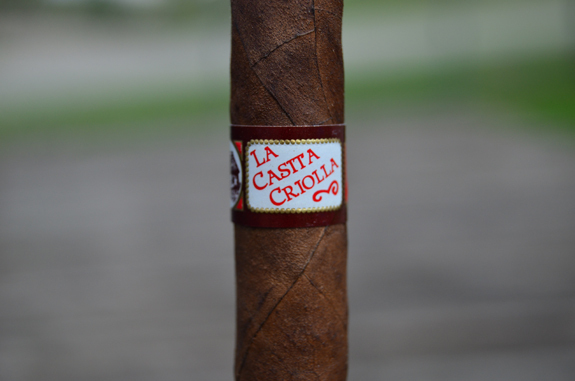 Pulling into the final third, the La Casita Criolla Lancero is showing off an unexpected richness. The cocoa and coffee are holding strong, while the sweetness is only making an appearance every so often. The strength continues to increase but has not made it in too full arena as the cigar begins to wind down. With just an inch remaining and the heat picking up, the La Casita Criolla is letting me know it is time to put down the cigar for its final rest. I remember my excitement for the La Casita Criolla line with it first arrived on the shelf several years ago. However, it has now been at least a few years since I have smoked one. Smoking the Lancero reminded me why I loved this cigar so much “back in the day”. Each time I light one up, I am blown away by what can be accomplished by a 100% Broadleaf cigar. It is not the most complex smoke, but it is far from boring. The performance is spot on, which has to be a daunting task to accomplish with only Broadleaf tobacco. The dark earth, coffee, and cocoa flavors with the subtle sweetness fit the bill perfectly for me. I know I have already said it, but I will say it again, stop wasting time and order up the Tatuaje Limited Lancero Collection already! Also, don’t forget to enter the giveaway that is going on right now! Casas Fumando and Famous Smoke Shop are giving away a six cigar sampler and Cigar Monster humidor jar HERE.